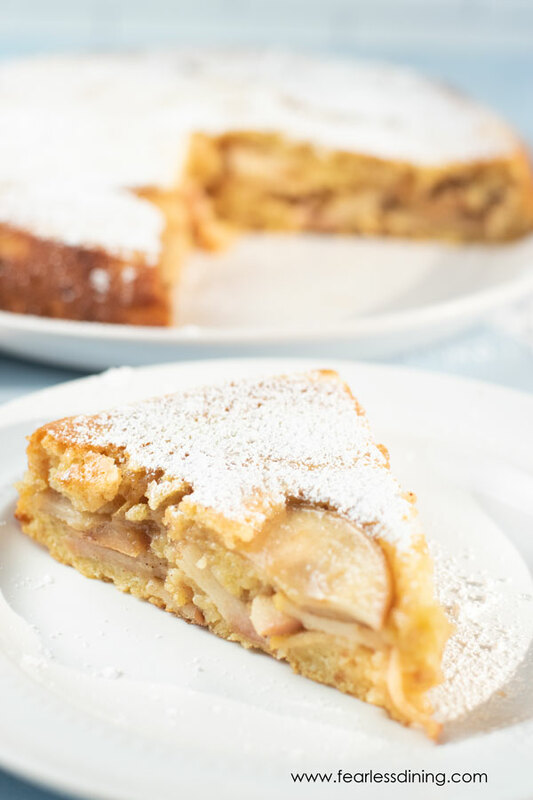 This sweet and fun gluten free Passover apple cake is exactly what you need for Passover! Whenever you combine apples and cake, it is obviously going to be scrumptious. There isn’t going to be a crumb when you try it because it is so good. The center is moist and delicious, while the outside is slightly chewy and crispy. I am not even kidding when I tell you, that you are going to want to eat the entire pan! If you love to use apples in your baking, don’t forget to check out my very best Gluten Free Apple Recipes! Who knew baking with gluten free matzo meal could be so tasty? If you are looking for a treat to enjoy while celebrating the Passover, then this one is sure to be a hit. My family looks forward to me making this recipe every year, and I am sure you will want to do the same. Just in case you aren’t sure exactly what Passover is, you should take a look at this fun and interesting article that explains everything perfectly: A Gentile’s Guide To Keeping Kosher For Passover. When you make a matzo cake, you will find it isn’t made the way traditional cakes are put together. First, you will pour some of the batter in the bottom layer of the pan; then you place a layer of apples. Top the apples with another layer of gluten free batter, and then you are ready to toss it in the oven. Is There Gluten In Matzo? Traditionally, yes there is gluten in matzo. It is a bread that is unleavened which means it was a dough that didn’t rise. The texture and crunch is similar to crackers. It is made with flour and water, so it is not gluten free. Thank goodness they now make gluten free matzo!! To keep this apple cake gluten free, use gluten free matzo meal that has been certified kosher. 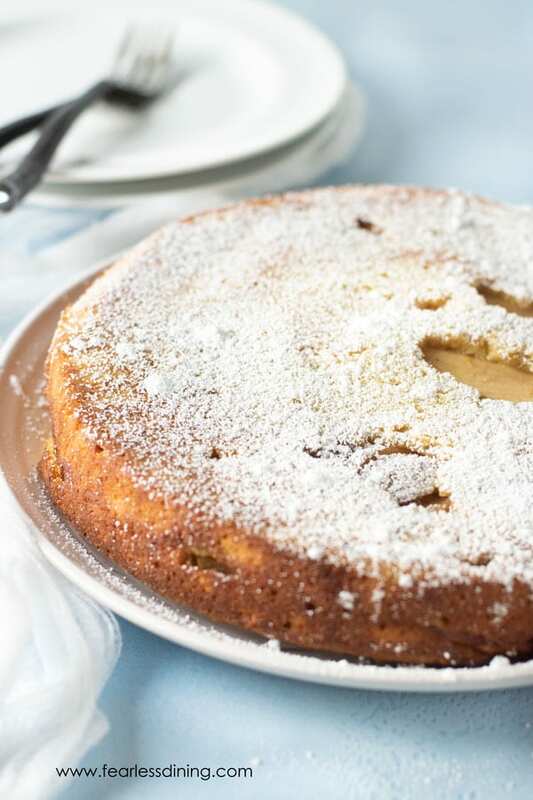 Can I Make This Passover Apple Cake As Muffins? Yes, you can turn this Passover apple cake recipe into muffins. Simply follow instructions as written and pour the batter into a lined or sprayed muffin tin. Bake for approximately 20-25 minutes until you can insert a toothpick, and remove it and it comes out clean. The muffins are just as scrumptious as the full sized cake; only you can grab them and go! Can I Freeze Gluten Free Matzo Apple Cake? 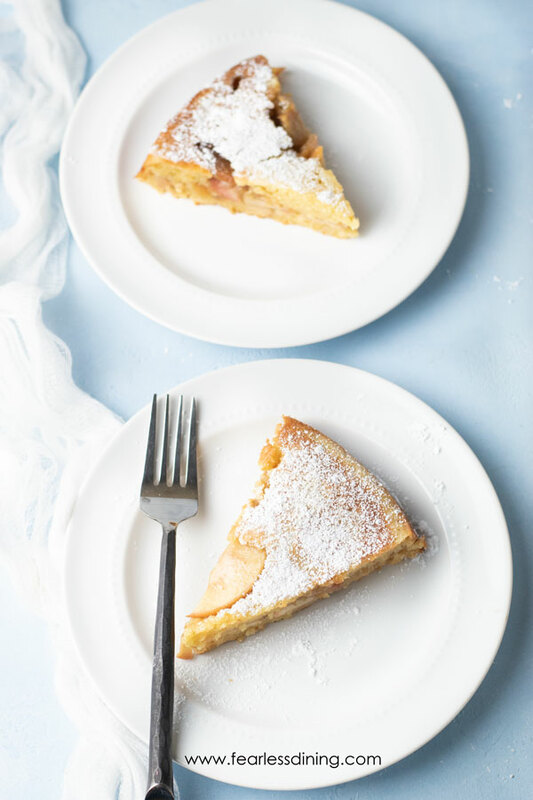 Yes, you can freeze gluten free matzo apple cake. The best way to freeze the apple cake is to tightly wrap it in plastic wrap, then place in freezer bag or airtight container. To thaw the texture and flavor is best if you thaw in the fridge. After it is defrosted, you can toss it in the microwave to warm it up before eating. Are you ready to make this delicious cake for yourself? 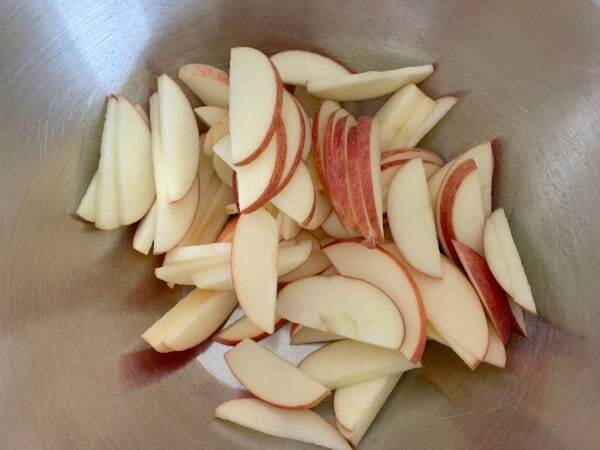 Start by slicing apples thinly and adding them to a bowl. I kept the peels on, feel free to remove the peels if you prefer. 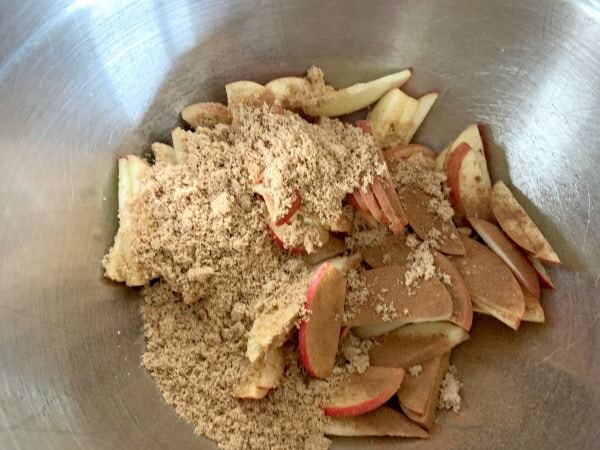 Add the cinnamon and topping mix to the apples and mix well. Spray a cake pan with coconut oil and line the bottom with parchment paper. This will make it a lot easier to get your cake out of the pan. Pour half of the cake batter into the pan. Top with the apple mixture. Then pour the remaining batter on top of the apples. Use a spatula to spread the batter around to make sure all of the apples are covered. See all of those yummy layers of apple? Bites of this cake are sooo crazy good. 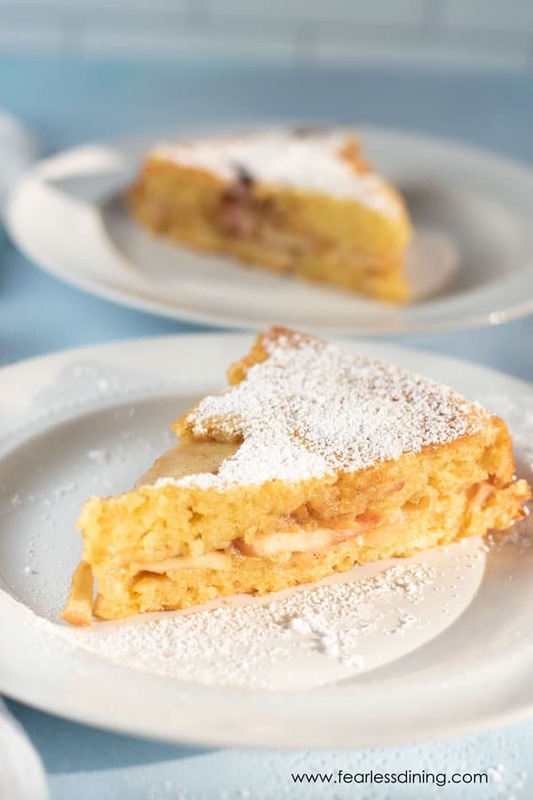 A delicious moist Gluten Free Passover Apple Cake. The cake is made with gluten free matzo meal, or gluten free matzo cake meal. 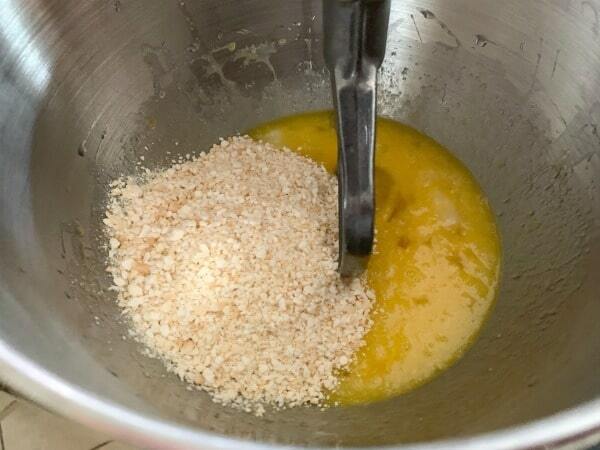 Add the cake batter wet ingredients to a standing mixer and mix on low speed, increasing the speed to medium. Mix for 1 minute. Turn off the power and add Matzo meal and Cassava flour. Mix on low speed until blended. Slice apples very thinly, I left the peels on. You can remove the peels if you like. 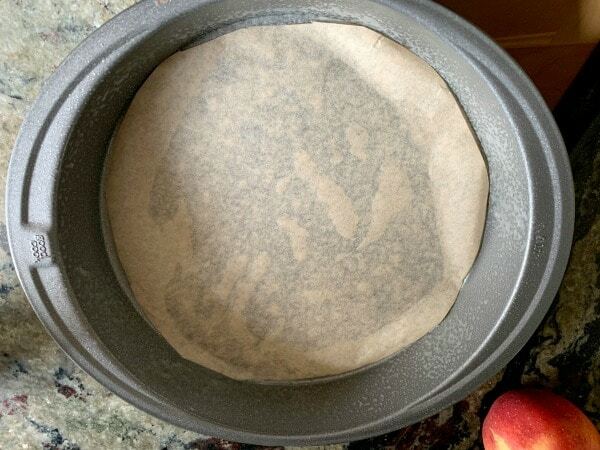 Spray a cake pan with coconut oil, and place a piece of parchment paper cut to the size of the pan on the bottom. 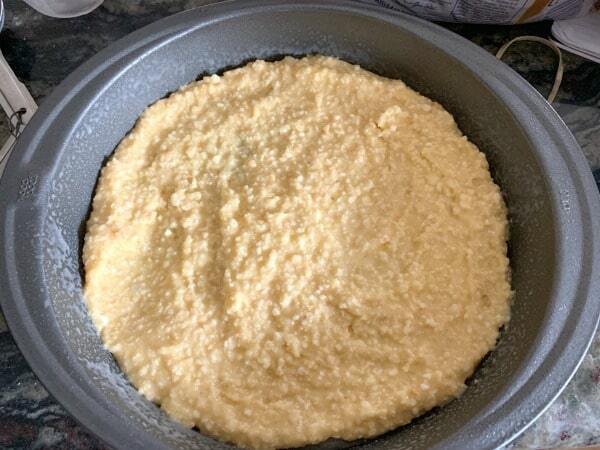 Pour half of the cake batter into the pan and spread it around to cover the bottom. Add the apple mixture on top of the batter. Pour the remaining batter on top and spread to cover the apples. Bake for 30-35 minutes until done. That is wonderful Aleksandra. Thank you for coming back to let me know! I have never baked with matzo meal let alone gluten free matzo meal. That apple cake looks so delicious!! Thank you so much Laura, it is one of our family favorites. So…the apple is one of my favorites and has been my whole life! THIS DESSERT looks super easy and delicious and creative to boot! 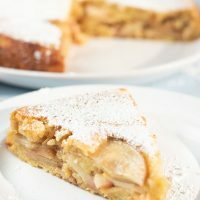 Keep those apple cake recipes coming!